The weather is getting colder, the days are getting shorter, and holiday displays are already popping up in the grocery store. For us at Hunter PR this means another annual ritual has kicked into high gear: The Hunter PR Food News Study! The interdisciplinary team made up of members from our agency’s food practice, national media relations and research & insights departments, along with our partners at Libran Research & Consulting, have already begun the process of pouring over hundreds (nay, thousands) of archived food stories from the year. However, we still have some unfinished business from last year’s study to attend to – the reveal of our Food News Consumers segmentation study. 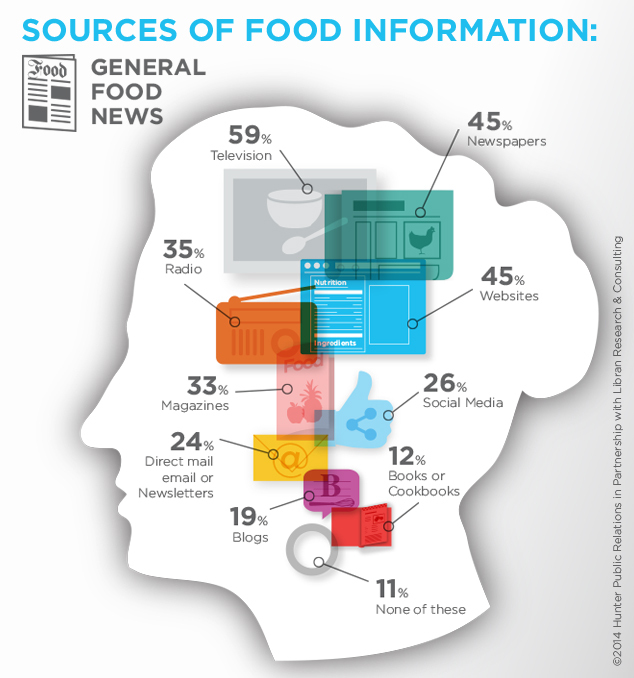 Things got really interesting in 2013 when, for the first time, we took a deeper look at how the US population consumes food information, from general food news to recipes and from nutrition information to food photography. 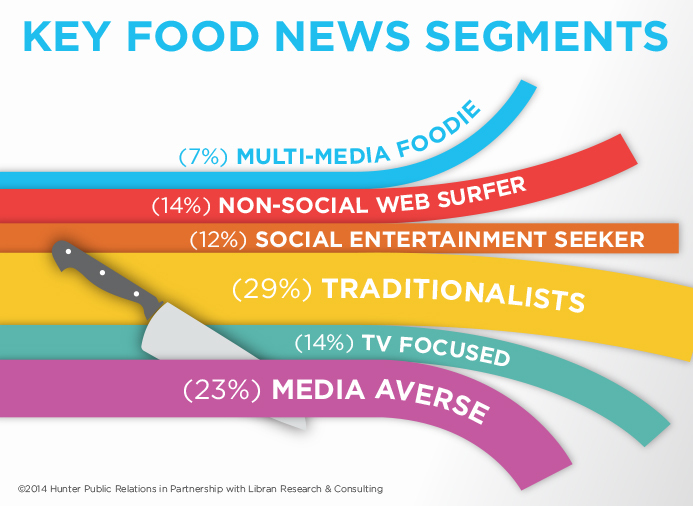 From this data, we identified six distinct segments of food news consumers. Understanding the attitudes, behaviors, and media consumption habits of these groups can help food marketers focus their efforts accordingly and deepen their connection to the minds, hearts, and stomachs of their target consumer. At long last, meet the Six Food News Consumers You Need to Know. These consumer archetypes differ from one another based on four underlying key dimensions: 1) are they generally receptive or not receptive to food media overall; 2) do they consume food-related media broadly, or more narrowly; 3) do they utilize more traditional or newer forms of media; and, 4) are they seeking an emotional/social connection, or purely information? Where each consumer falls on these dimensions helps to determine the group in which they belong. At 29% of the population, Traditionalists make up the largest group of the six segments we defined. 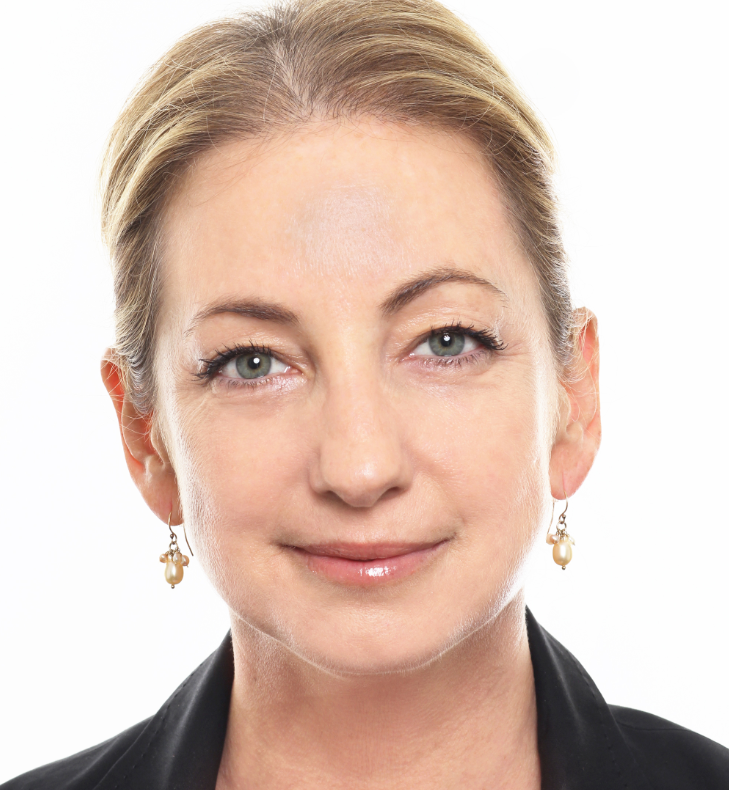 Comprised largely of Gen-X and Boomers, these broad consumers of food related information may be posting about their children on Facebook, but they are eschewing social media for more traditional sources of fact-based food news including newspapers, (yes, newspapers), television, and magazines. The Social Entertainment Seeker, on the other hand, seeks to connect with others through food. At 12% of the population, the youngest of our six segments (and an emerging purchasing powerhouse) wants to be a part of the conversation, and is the most engaged across all social mediums for recipes and nutrition information. Non-Social Web Surfers, a slightly larger segment, are all about the facts, Jack, and the majority of their top sources of food information are preceded by “www” including the digital editions of newspapers and health and wellness websites. TV-Focused Boomers, at 14%, want their food news served to them on a TV tray, the polar opposites of our favorites, the Multi-Media Foodie. While, sigh, the Multi-Media Foodie makes up only 7% of the population, this high income influencer is resolving to eat and cook more at home. Given the amount of food related media they consume, it’s a wonder they can find the time to actually get around to cooking! Finally, there’s the Media Averse. With TV remote firmly in hand, this mostly male segment comprising 23% of the population has a relatively low interest in food related information or in eating healthfully. Let’s hope that whomever is shopping and cooking for them does! For more information about each of these segments, enjoy our Slide Share or contact me at smormar@hunterpr.com, and keep a look out in early December for the release of Hunter PR’s 12th annual Food News Study. Spoiler alert – there’s likely to be bacon involved….